Growing Up Disney: Kid's Power Pack, Where Have You Been All My Life? Kid's Power Pack, Where Have You Been All My Life? 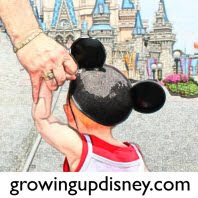 Last week, the whole Growing Up Disney family went to Walt Disney World. On Thursday, we had a big lunch at Sanaa (yum! Another post.) and then split up for the afternoon. That evening most of the crew met up at Disney's Hollywood Studios to see The Osborne Family Spectacle of Dancing Lights (fabulous! More posts to come.) After the lights, I needed to feed the kiddos so we headed for the ABC Commissary. My children don't eat the widest variety of foods and the kid's meals at DHS tend toward chicken nuggets. I was thrilled to see the Kid's Power Pack on the menu. For $5.49 we got a small carton of milk (other options are available), strawberry yogurt, a cheese stick, goldfish crackers, carrots with ranch, and a chocolate chip cookie. These meals have been around for a year or so, but this was my first time to check one out personally. For starters, the box was adorable and my husband must have worked some sort of magic to get Tink to let him throw it away when we left the restaurant. The box alone bought a little time for me to finish my Asian Salad with Salmon, which was pricey at over $11 but tasty. The girls like all the foods in the Power Pack so we didn't have to cajole them to eat anything. They dove right in and since they are 3.5 years and 17 months old, one meal was plenty for the both of them, especially after a good lunch and afternoon snacks. While it's not nutritional dinner of the year, it made a fabulous, quick, easy, meltdown delaying meal. They eat their veggies pretty well at home so I'm not too worried if vacation is relaxed. We discovered this last trip and wondered if other parks have the power pack as well? My Tink loved this too!